This kit is a must for reading professionals who work with teen and adult students. Four- and five-sound 'nonsense word' word building sets. Three-, four-, and five-sound phoneme manipulation drills. 100 multisyllable word building sets. 20 short passages, on 8 1/2"x 11" prelaminated cards, for practicing skills and code knowledge, improving fluency, for code cueing variation and overlap. 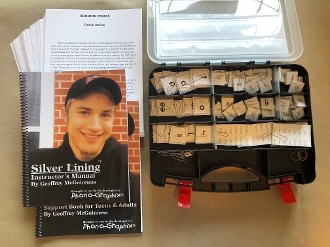 1 copy of our Silver Lining workbook for improving reading and spelling speed and accuracy, printed on high quality paper with a full color cover and spiral binding.